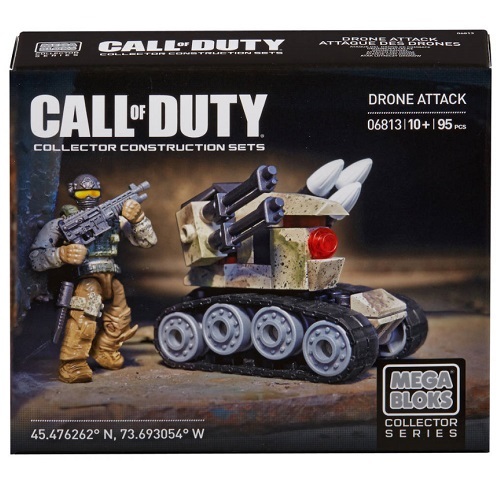 MBCOD: The Mega Bloks Call of Duty Set 6813  Drone Attack [COD] looks definitely worthy of BA Toys! An M.A.F., accessories and an assault drone at this price-point? What a great looking value! The Drone Attack is an unmanned drone meant to engage and suppress the enemy in extremely hazardous areas and situations. This buildable assault ground drone measures 3.5L x 2.25W x 2.5H in inches with real working treads, mock missile launcher and a 360-degree rotating turret. The Drone Attack includes one micro action figure capable of extreme poseability, and highly detailed, authentic interchangeable accessories and weapons that allow for mission-specific customization.